Andy Samberg debuted the first poster for the previously untitled Lonely Island movie on Jimmy Kimmel Live! last night. 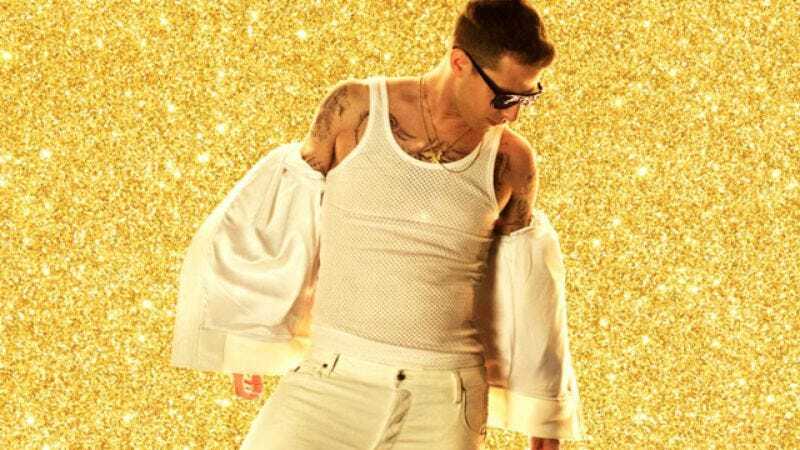 Now titled Popstar: Never Stop Never Stopping, the film stars Saturday Night Live digital shorts bosses Samberg, Akiva Schaffer, and Jorma Taccone, a.k.a. The Lonely Island. The movie follows singer/rapper Conner4Real (Samberg) after the release of his sophomore album, which flops, leading him to throw his mic on the ground and question his entire life and purpose on this planet. The crisis of popularity, naturally, leads him to reunite with his former boy band. Popstar: Never Stop Never Stopping also stars Sarah Silverman, Tim Meadows, and Maya Rudolph and promises cameos from “many of the biggest names in comedy and music.” The film was co-written by the full Lonely Island trio, co-directed by Schaffer and Taccone, and produced by superproducer Judd Apatow, Rodney Rothman (Forgetting Sarah Marshall), and The Lonely Island. In recent years, The Lonely Island crew has kept busy with projects off the island: Samberg currently stars on Brooklyn Nine-Nine—a role that earned him a Golden Globe in 2014. Taccone appeared in the final season of Parks And Recreation and directed two episodes earlier in the show’s run; last year, he also executive produced Diary Of A Teenage Girl. Schaffer directed the season one finale of Brooklyn Nine-Nine. Together, the trio are also executive producing the upcoming Fox sketch series starring Nicole Byer, Party Over Here. Popstar: Never Stop Never Stopping can’t stop, won’t stop, and will hit theaters June 3.